or two of water. Once the dough holds its shape, cover with plastic wrap and place in the refrigerator. 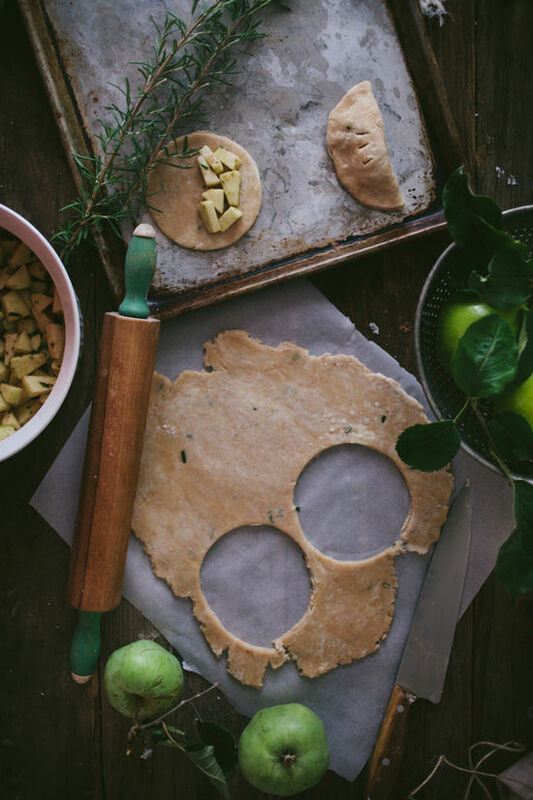 • To prepare the filling, toss the apples with the honey, sugars, rosemary, and cinnamon until the apples slices are coated in the mixture. Set aside. • Preheat the oven to 375 degrees Fahrenheit and line a large baking sheet with parchment paper. To assemble, roll out the dough until it is 1/4 inch thick. Cut 5-inch diameter circles out of the dough and place them on the baking sheet. Add about 2 heaping tablespoons of the filling to one side of the circle, keeping it away from the edges. Dip your finger in water and run it along the edge of the side without the filling. Fold that side over the filling and press the edges together with your thumb and forefinger to seal. Repeat until all the dough or filling is used up. 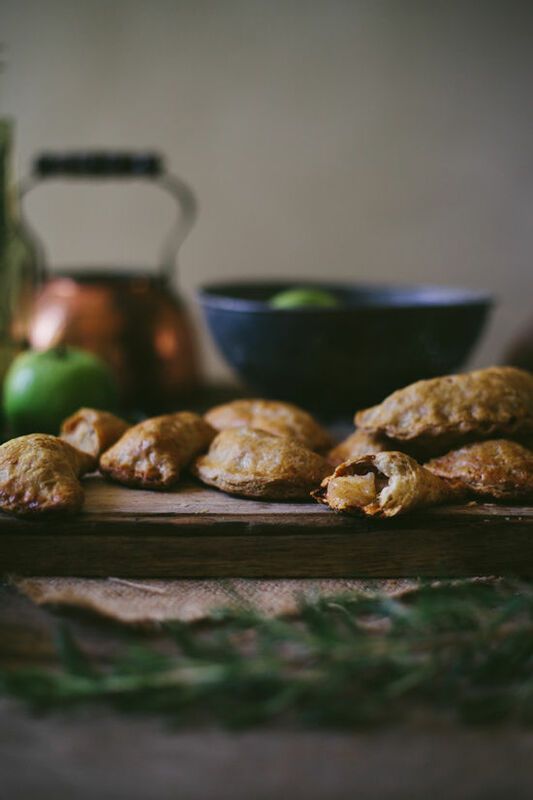 • Lightly brush the hand pies with the egg wash. Use a small sharp knife, such as a paring knife, to cut 3 slits in the top of each hand pie to allow steam to escape. Place the pan in the oven and bake in the center rack for about 45-55 minutes or until the hand pies are golden brown and hard when you poke them. Remove from the oven and allow to cool completely before serving. thanks for another beautiful recipe, eva! 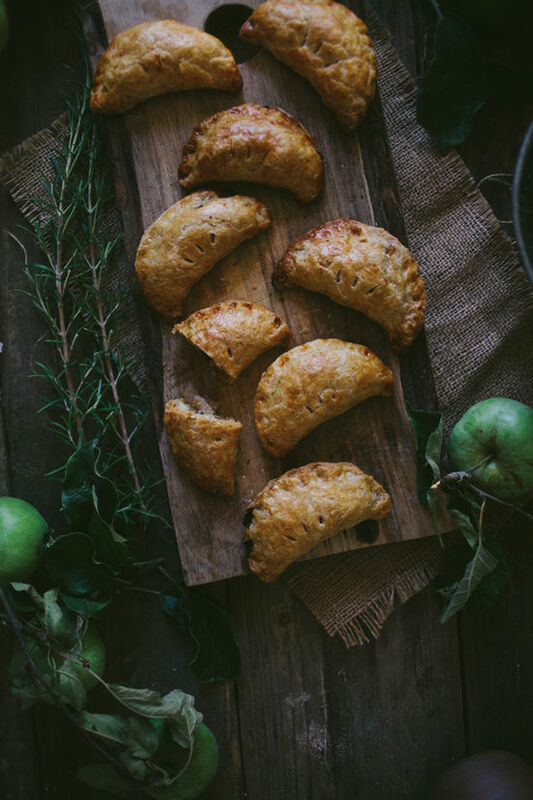 If these just aren’t the most delicious, and gorgeous hand pies I’ve seen, I just don’t know what is. Such an amazing recipe too! 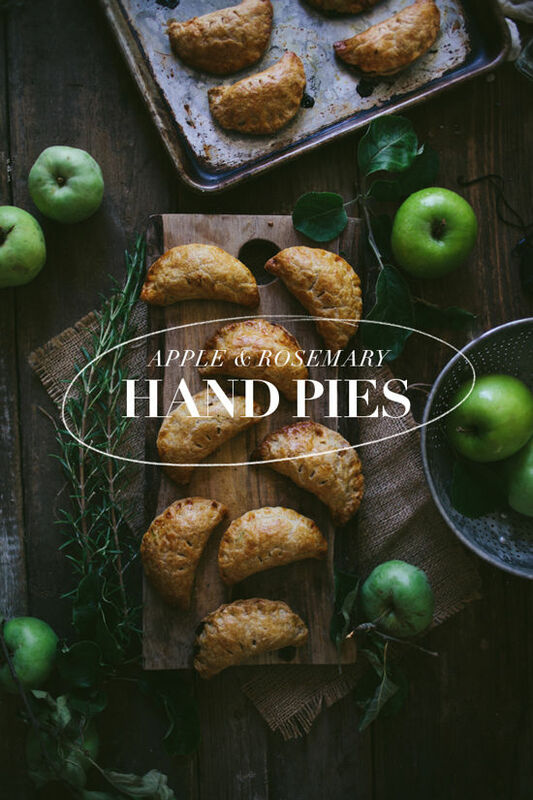 would never think of pairing apple and rosemary but now that you suggest it, it sounds delicious! Apple and Rosemary is a combination that I have never tried before. Sounds great though!! Eva’s beautiful photography and delicious recipes continue to amaze me. This one is yet another example. This is a great recipe to help us use the juicy apples that the autumn will bring our way. This looks incredible. So ready for apple season. Great recipe! Rosemary and apples are a perfect fall combination. I also want to try these with 1/2 whole wheat flour and 1/2 all purpose. Delicious combination of sweet with rosemary!! I loved it! The crust didn’t turn out great for me, a little tough and too thick. Totally my fault though as I didn’t use the egg wash.
Beautiful photography. The apple pie/rosemary combo sounds interesting. I have some rosemary in my garden. I may have to give this a try. I really like the idea of the rosemary in the crust.